Located between Méditerannée and Cevennes, and bordered by south bythe the bassin de THAU, Domaine La Grangette is situated in the center of the Languedoc AOP of Picpoul de Pinet. However the domaine also has a very storied past. During the Middle Ages, the domaine was part of a vast territory under the responsibility of the Baron de Guers. To feed the significant cavalry of the castle, the domain used to cultivate cereals and alfalfa. The name Grangette, which signifies a small barn, is derived from this significant piece of domaine's history. 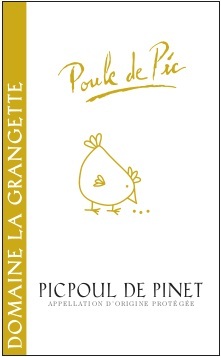 Domaine La Grangette is the only estate to produce a white, red and rosé from the Picpoul grape variety. Under the thoughtful ownership and stewardship of Michel and Christelle Moret pictured above, Domaine La Grangette practices sustainable viticulture with low yields and an eye towards the future. Brisk, mineral-laden and clean, Poule de Pic is the perfect choice for fruits de mer, fish tacos or ceviche. A crisp and crunchy red, not often seen in the region. Great with a slight chill as you would many a Beaujolais or Spatburgunder. Perfect with grilled tuna or lentil based dishes.